Looking for the right mobile framework? 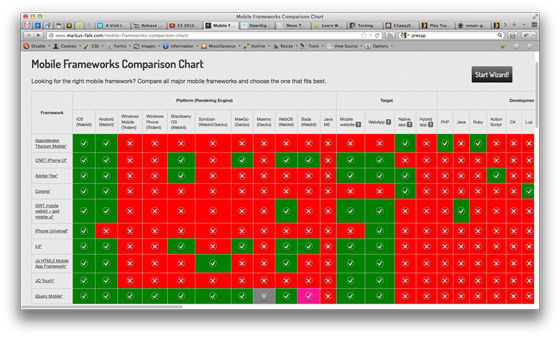 Compare all major mobile frameworks and choose the one that fits best. Very complete chart listing target platforms, target apps (native/hybrid/web), languages it can be developed in, hardware support, etc. Also: Who was I to think that there were only a few players (PhoneGap, Appcelerator Titanium, jQuery Mobile, Sencha Touch) out there?